UFC Pickled Mustard Spathe in Brine is produced from carefully selected large size mustard leaf. It is a great source of vitamins B6, C, and E, folic acid, calcium, carotenes, manganese, copper, and fiber. The mustard leaves are pickled naturally with an addition of natural soy sauce to add flavours. 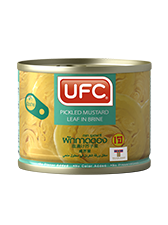 UFC Pickled Mustard Leaf in Brine is packaged in glass jars or easy peel cans for consumer’s ease. It does not contain any preservative and can be refrigerated to be consumed overtime. This product is also ideal for vegetarians and vegans. Perfect to add in all cooking recipes or ready to serve with boiled rice.